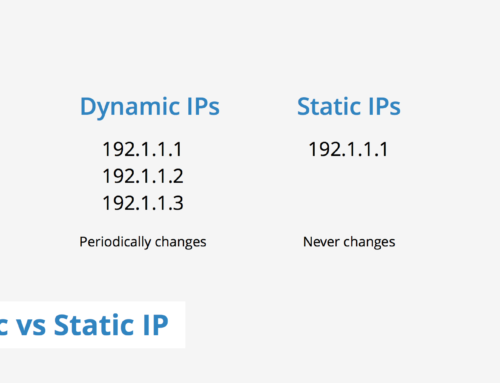 Do I Need a Static IP? Download PDF of Blog Post. Let’s say you just finished signing up for GoBrolly Internet and your kids come home for summer break. Can you upgrade? Absolutely. You can also pay your bill online, update your account details, check your statements and check your usage. 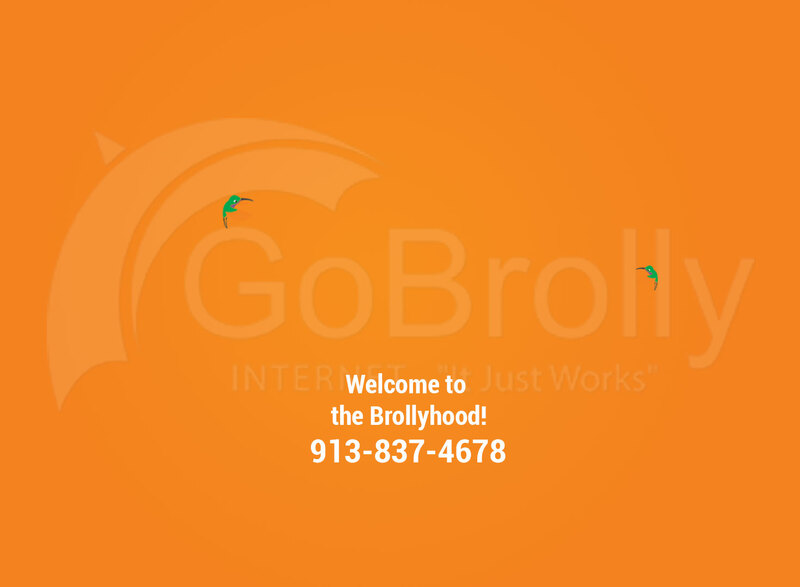 Below is a step-by-step tutorial on how to access your GoBrolly Internet account. In the right-hand corner, select MY ACCOUNT then select from the drop down, MANAGE MY ACCOUNT. Login with your username and password that was given to you during the installation process. If you do not remember your username and password, please contact us at 913.837.4678 and we will be happy to help you with that. 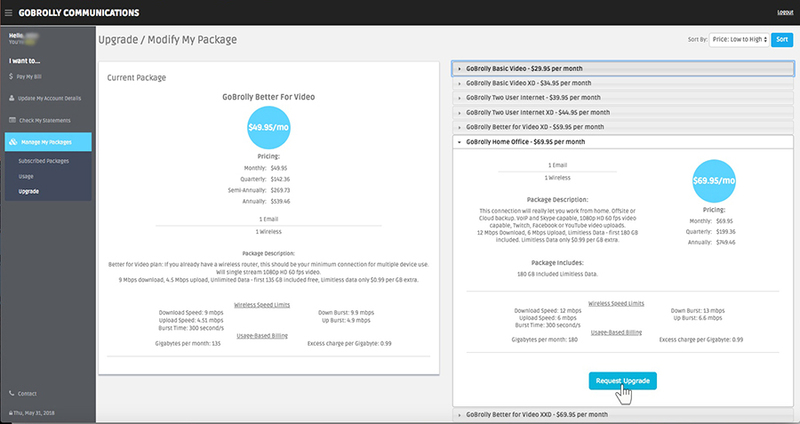 Go to Manage My Packages and select UPGRADE from the dropdown list. Your request will be received by our office and your speeds and data will change. This process could take up to several hours, but if the request is made during the office hours of 8:00 a.m. to 5:00 p.m, you might see it update immediately. 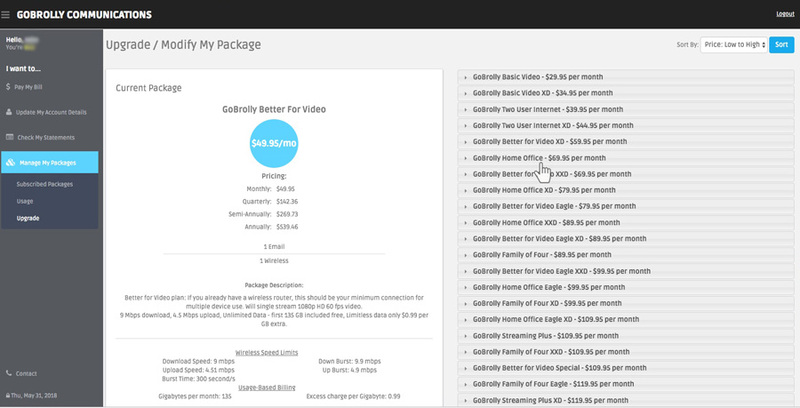 Go to Manage My Packages and select USAGE from the dropdown list. Here is where you will see your data usage with a graph on the right showing hours and bandwidth. Bandwidth includes Uploads and Downloads. With the example we are using here, you can see that May 15 there was an increase in data being used which is why the Customer chose to upgrade the account for just $10.00 more a month. Hey, we know that life happens. So we have made it easy for you to change your package at any time. And of course, if you have any questions you can call our office at 913.837.4678. GoBrolly®, is an Internet service provider founded in 2014. 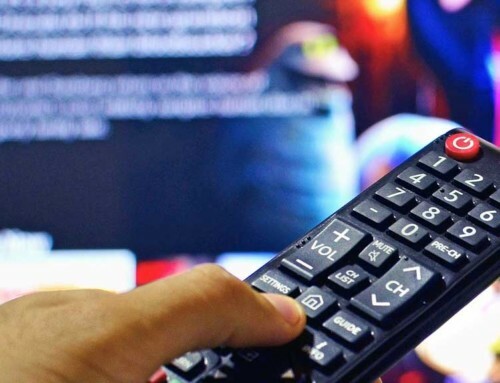 The company provides superior Internet access with exceptional bandwidth to residents of Miami County, Kansas and Cass County, Missouri, including Louisburg, Paola, Wea, Hillsdale, Cleveland, Drexel and more. GoBrolly® created the Jewel program at the end of 2014 to honor and recognize community assets. As a small business in a small community, GoBrolly® saw the need to bring to the forefront people who they feel make a difference in our area. Once selected as a GoBrolly® Jewel, GoBrolly® writes a blog post about the individual or business, and includes all online social avenues to contact or read more about the Jewel. GoBrolly® then places this post on many social media outlets like Facebook, Twitter, LinkedIn and Google+. Most of our Internet plans exceed the FCC Rural Broadband Requirement. Our top tiered Internet plans exceed the FCC Broadband Requirement.